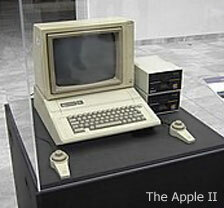 Apple introduced the Apple II at the West Coast Computer Faire in 1977. After VisiCalc was released, Apple II sales skyrocketed in the late 1970s and into the early 1980s. Others began to see the potential of the Apple market. Many other computer manufacturers from both the United States and abroad attempted to jump onto the Apple bandwagon and also become huge successes. As a result, so many clones were produced that an entire website has been made for them, apple2clones.com. The most popular clones were the Laser and Franklin Ace models. Many of the Apple II clones were not actually manufactured by American companies, but overseas in countries such as Germany, Taiwan, and Brazil. This made it very difficult for Apple to sue them, but it also meant that these computers were less well known. 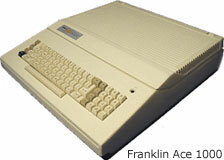 The Franklin Ace clone resulted in a lawsuit against Franklin Computer Corp. It was the first successful attempt in a US court of law to prove that computer software could be protected by copyright. 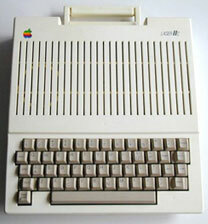 When the Franklin Ace clone was introduced in 1982, Apple determined that the Franklin ROM and operating system were copied from Apple’s versions. The court favored Franklin initially, but in 1983 the United States Court of Appeals for the Third Circuit determined that computer software, including operating systems and system ROMs, could be protected by copyright. Apple was able to force Franklin to withdraw its clones by 1988. Because of the Apple vs. Franklin case, a small icon that said “Stolen!! © Apple” was hidden in the ROM during the development of the original Macintosh. Susan Kare designed the icon, and Steve Capps and Andy Hertzfeld worked on implementing it, so that when the ROM was copied, the icon would appear. The late model Laser 128 clone was the only legal clone of the Apple II (the company “clean roomed” the Monitor ROM, making the Laser ROM legal). The Laser 128 was compatible with the Apple IIc. It was originally released in 1982 in the United states by Video Technologies, Inc. VTech even contacted Microsoft for a license to Applesoft BASIC, and Microsoft sold it to them. 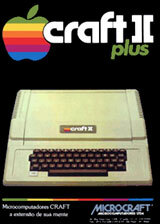 Another clone, named craft II plus, was manufactured by Microcraft. The company used the Apple logo and the Motter Tekkura font, which Apple used, in its advertisements. Another advertisement, for a clone made by Basis Incorporated, used a rough copy of the Apple logo in its advertisement in the April 1981 issue of BYTE magazine. And many other clones illegally used Apple’s logo, such as the Micro II+. Another notable clone was the Unitron, made in Germany. 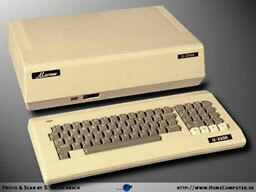 The Unitron U-2200 Apple II clone was introduced in 1983, was known for being reliable and had a separate keyboard rather than a built-in like the original Apple II. 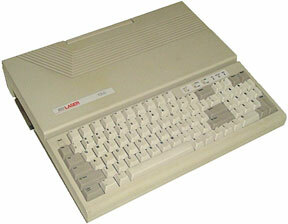 The U-2200 used a 1 MHz 6502A and 2 MHz Zilog Z80 processor, and had 64 KB RAM expandable to 128 KB. Unitron also made a clone of the Macintosh 512k in Brazil. Although not technically a clone, the Bell & Howell Apple II Plus was a limited edition Apple II Plus manufactured by Apple for Bell & Howell. Featuring a dark battleship grey case, it is much the same as the normal beige Apple II Plus, but it includes more ports on the back. 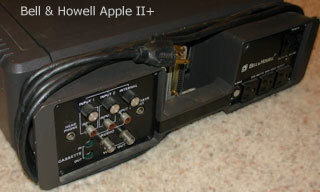 The Bell & Howell Apple IIs were made primarily for education, where Bell & Howell had a strong presence with AV equipment. Today most of the Apple II clones are very rare. Most of them sold poorly when they were released and subsequently disappeared from the market quickly. Hi there, congratulations for the article! May I correct some errors on it? – Unitron from China and Unitron from Brazil are different companies. Brazilian unitron made the Unitron APII (apple clone), Unitron AP IITI (apple clone with an intelligent keyboard) and the famous Mac512 clone. – Most brazilian apple clones cloned everything, incluiding apple logo, colours, cabinets, boards (! ), everything. Exceptions: Maxxi, Spectrum ED, Microengenho, Microengenho II, Exato Pro (same board, different power supply and case), Exato IIe (IIe clone but completely different), TK3000 IIe. – Milmar even made a computer with “Apple II+ badge” just cloned from original. If you want more info, I can detail. There was also the Italian “Lemon II”. It was cloned from the very first Apple II to reach Italy. They hired it from the freshly opened Apple Italian office, disassembled it, desoldered the components from the logic board, dumped the ROM, made a photocopy of the board and reassembled and returned the whole thing in 24 hours! I remember when these clones started flooding the market. Most came from China and were shipped in with names like Pineapple or Orange. 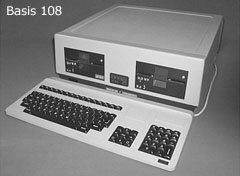 They would frequently ship with a Z80 chip on the motherboard and were capable of running as stand alone CP/M machines. They would also have sockets on the board for the 6502 and the Apple ROMs, which would be installed in the US after the CP/M only machines had passed through Customs. It was really a clever scheme. Apple couldn’t stop the machines from coming through Customs, because there was nothing illegal about them because they weren’t Apple compatible at that point yet.